Salivary gland tumors accounts for less than 3% of head and neck tumors. Pleomorphic adenomas, or benign mixed tumors, make up around 65% of all salivary gland tumors and also are the most common type of tumors of the minor salivary glands. Tumors arising from the minor salivary glands are uncommon clinical entities, accounting for 10-25% of all salivary glands tumors. Palate is the most commonly affected site followed by the upper lip and buccal mucosa respectively. A case of pleomorphic adenoma of the minor salivary gland of palate has been discussed. 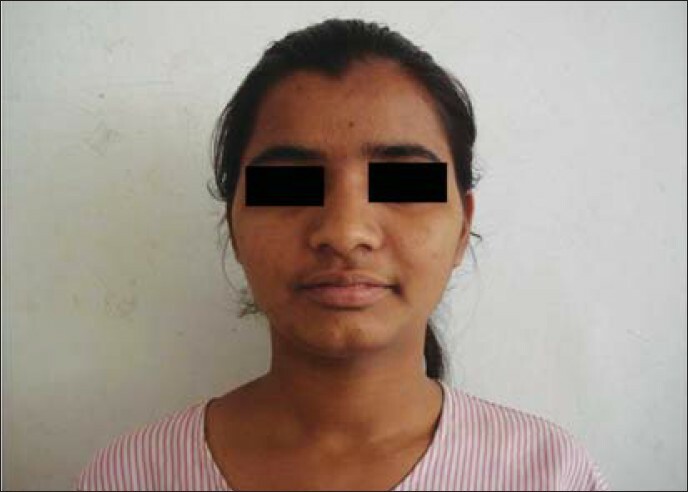 An 18-year-old young female patient reported to Department of Oral and Maxillofacial Surgery in Sinhgad Dental College and Hospital, Pune, with the chief complaint of swelling on the left side of the posterior palate since 4 months [Figure 1]. The medical history was noncontributory. The swelling was painless with no discharge. Intraoral examination revealed a soft tissue mass measuring approximately 1.5 cm × 1.5 cm in diameter on the left side of the posterior part of hard palate. The oral mucosa covering the lesion was ulcerated having history of trauma 1 week back. On palpation the swelling was rubbery in consistency, nontender, sessile, and appeared fixed to the underlying tissue [Figure 2]. Based on the clinical picture and history, a provisional diagnosis of a benign salivary gland tumor was made. CT scan revealed no perforation but only cupped-out resorption of palate. A incisional biopsy was performed under local anesthesia. The histopathology picture showed a tumor mass composed of epithelial and mesenchymal components, with highly cellular and scanty connective tissue stroma cells. 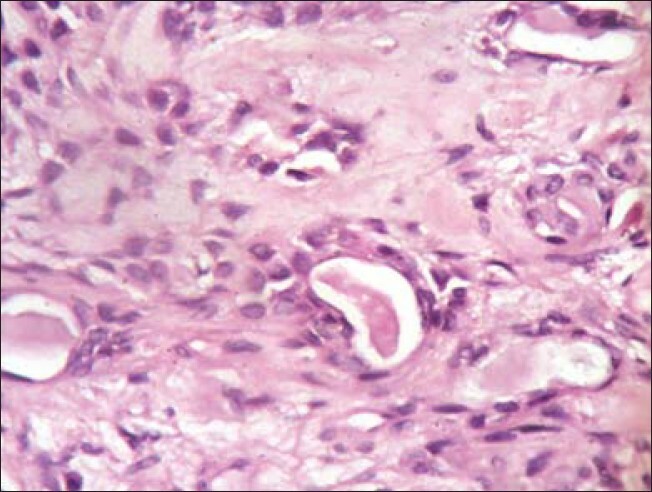 Epithelial ductural structures were seen with little cytoplasm and basophilic nucleus. Areas of spindle cell proliferation resembling myoepithelial cells were evident. Myxomatous and chondroid areas were also seen [Figure 3]. 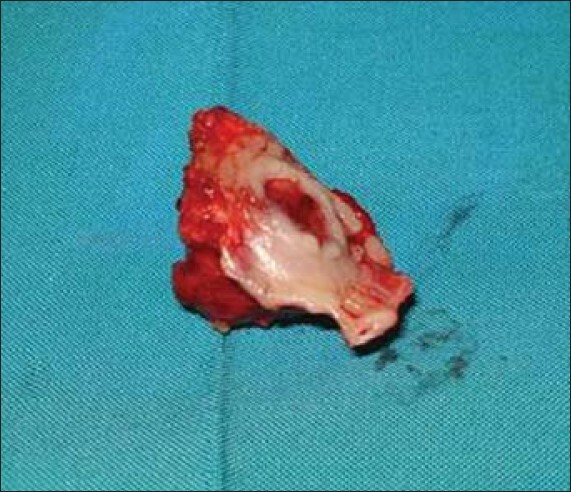 The patient was treated by wide local excision [Figure 4] and the tumor was excised [Figure 5]. A palatal splint was placed to aid in hemostasis and cover the denuded bone. The wound healed uneventfully with no recurrence [Figure 6]. As stated earlier, tumors arising from the minor salivary glands are uncommon clinical entities. Among them palate is the most commonly affected site followed by the upper lip and buccal mucosa respectively. Pleomorphic adenoma arising from the minor salivary gland of palate occurs as a firm, painless mass with intact overlying mucosa. However, if the mucosa is ulcerated, it is mostly attributed to trauma or biopsy. If not, the mass should be considered for a malignancy. Since pleomorphic adenoma of palate appears fixed to bone, this is not caused by bony invasion but rather by the inelasticity of the palatal mucosa, which becomes distended by the tumor mass and may eventuate in a cupped-out resorption of bone. In other oral mucosal sites, it presents as a freely movable, circumscribed mass. Patients with pleomorphic adenomas of the minor salivary glands present mostly in their fourth to sixth decades, with a slight predominance in female patients. CT scan is the important diagnostic tool for these tumors, as it helps to determine the extension of the lesion and also in evaluating involvement of the bone. Wide excision with negative margins is the optimal strategy for the management of pleomorphic adenomas. Pleomorphic adenomas of minor salivary glands, like those on the palate, buccal mucosa, or lip, occasionally lack encapsulations and may mix into normal host tissue as tumor grows;  hence, a wide excision is necessary even if previous biopsies report a benign nature. Pleomorphic adenoma generally does not recur after adequate surgical excision. Pleomorphic adenoma is an uncommon benign salivary gland tumor affecting the palate. Early diagnosis and wide local surgical excision result in complete removal of the pathology with no recurrence. 1. Luna MA, Batasakis JG, EL-NaggarAK. Salivary gland tumors in children. Ann Otol Rhinol Laryngol 1991;100:869-71. 2. Waldron CA, Gnepp DR. Tumors of the intraoral minor salivary glands: A demographic and histologic study of 426 cases. Oral Surg Oral Med Oral Pathol 1998;66:323-33. 3. Lucas RB. Pathology of tumors of the oral tissues. 4 th ed. Edinburgh: Churchill Livingstone; 1984. p. 298-9. 4. Spiro SH. Salivary Neoplasm: Overview of a 35 years experience with 2807 patients. Head Neck Surg 1986;8:177-84. 5. Robert EM, Diane S. Oral and Maxillofacial Pathology- A rationale for diagnosis and treatment. Chicago: Quintessence Publishing Co, Inc; 2003. p. 528-33. 6. Vellios F, Shafer WG. Tumors of minor salivary glands. Surg Gynecol. Obstet., 108: 450-456. 6. 7. Batsakis JG. Neoplasms of the minor and 'lesser'major salivary glands. In: Tumors of the Head and Neck. Baltimore: The Williams and Wilkins Company; 1981. p. 38-47. 8. Luna MA, Batasakis JG, EL-Naggar AK. Salivary gland tumors in children. Ann Otol Rhinol Laryngol 1991;100:869-71. 9. Mendenhall WM, Mendenhall CM, Werning JW. Salivary gland pleomorphic adenoma. Am J Clin Oncol 2008;31:95-9. 10. Gnepp DR. Salivary gland (major and minor) and lacrimal gland. In: Gnepp DR, editor. Diagnostic surgical pathology of the head and neck, 2 nd ed, Philadelphia: WB Saunders; 2009. p. 434-49.